O'Loughlin Gaels added the Duggan Steel under 14A title to the under 16 one won earlier when they defeated Erins Own 4-11 to 3-9. A 2-4 scoring burst from full forward Mikey Wallace just before half-time proved decisive. 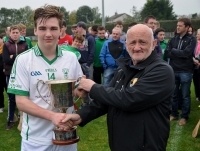 Picture shows Bord ns nÓg chairman Willie Dempsey presenting the trophy to the O'Loughlin Gaels captain. Congratulations to Dicksboro’s under 16 Roinn ‘A’ team on winning the county final on Tuesday night, overcoming city rivals, James Stephens by 1-17 to 0-10. A strong wind was a big factor in this match as the Village side, playing with the win in the first half, had a lead at half-time of 0-9 to Dicksboro’s 0-5, but the ‘Boro side made better use of it in the second half. It was smiles all round on Saturday for the Kilkenny secondary schools in the Leinster A Hurling Championship. One of the pre tournament favourites CBS had to produce a superb second half to see off Colaiste Eoin.